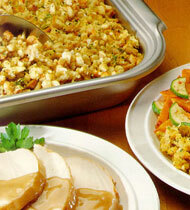 Serve this delicious and filling side dish at any time of the year - not just Thanksgiving! All you need is butter, water, Pepperidge Farm® stuffing, apples, and pecans to wow your patrons. 2. Add stuffing, apples and pecans. Mix lightly. Place in greased full hotel pan (20x12x2).